Raumfahrt+Astronomie-Blog von CENAP - Blog: Astronomie - Sind die 2 Kometen, die sicher an der Erde 21/22 März vorbei fliegen Zwillinge? Comet 252P/LINEAR will safely fly past Earth on March 21, 2016, at a range of about 3.3 million miles (5.2 million kilometers). The following day, comet P/2016 BA14 will safely fly by our planet at a distance of about 2.2 million miles (3.5 million kilometers). Comet P/2016 BA14 was discovered on Jan. 22, 2016, by the University of Hawaii's PanSTARRS telescope on Haleakala, on the island of Maui. It was initially thought to be an asteroid, but follow-up observations by a University of Maryland and Lowell Observatory team with the Discovery Channel Telescope showed a faint tail, revealing that the discovery was, in fact, a comet. The orbit of this newly discovered comet, however, held yet another surprise. Comet P/2016 BA14 follows an unusually similar orbit to that of comet 252P/LINEAR, which was discovered by the Massachusetts Institute of Technology's Lincoln Near Earth Asteroid Research (LINEAR) survey on April 7, 2000. The apparent coincidence may be an indication of twin nature in that comet. P/2016 BA14 is roughly half the size of comet ‪252P/LINEAR and might be a fragment that calved off sometime in the larger comet's past. Observations made by the Hubble Space Telescope of comet 252P/LINEAR, and by NASA’s Infrared Telescope Facility of comet P/2016 BA14 will further investigate their possible twin nature. 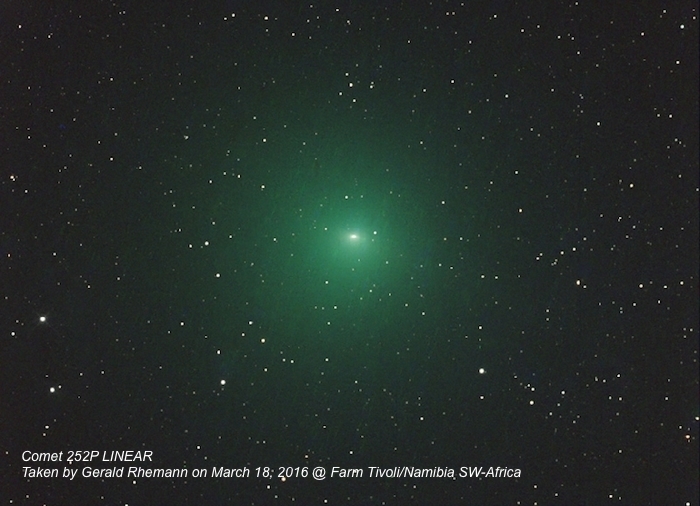 On March 21st, green comet 252P/LINEAR will fly by Earth only 5.4 million km away-- the fifth closest cometary approach on record. One day later, a suspected fragment of the comet will pass even closer (3 million km). The name of the fragment is "P/2016 BA14," and Gregg Ruppel has photographed it zipping among the stars over Animas, New Mexico, on March 18th. "I observed P/2016 BA14 using a 10-inch telescope and a STL11000 deep-sky CCD camera," says Ruppel. "I used a 12-inch telescope for this 360-second color exposure," says Rhemann. The comet is green because its vaporizing nucleus emits diatomic carbon, C2, a gas which glows green in the near-vacuum of space. The verdant color will become even more intense in the nights ahead as 252P/LINEAR approaches Earth. There is a chance that the comet's approach could cause a minor meteor shower. According to the International Meteor Organization, "[modeling by forecaster] Mikhail Maslov indicates that there might be a weak episode of faint, very slow meteors (15.5 km/s) on March 28–30 from a radiant near the star μ Leporis." Little is known about meteors from this comet, so estimates of the meteor rate are very uncertain. Maslov's models suggest no more than 5 to 10 per hour. 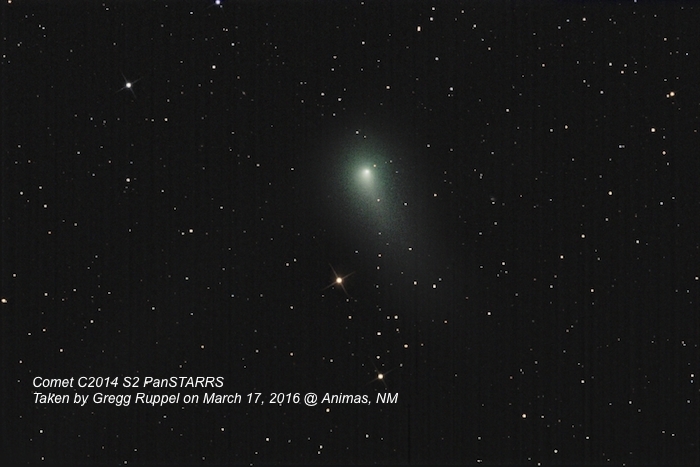 Astronomers were watching when comet P/2016 BA14 flew past Earth on March 22. At the time of its closest approach, the comet was about 2.2 million miles (3.5 million kilometers) away, making it the third closest comet flyby in recorded history (see "A 'Tail' of Two Comets"). Radar images from the flyby indicate that the comet is about 3,000 feet (1 kilometer) in diameter. The scientists used the Goldstone Solar System Radar in California's Mojave Desert to track the comet. "We were able to obtain very detailed radar images of the comet nucleus over three nights around the time of closest approach," said Shantanu Naidu, a postdoctoral researcher at NASA's Jet Propulsion Laboratory in Pasadena, California, who works with the radar team and led the observations during the comet's flyby. "We can see surface features as small as 8 meters per pixel. "The radar images show that the comet has an irregular shape: looks like a brick on one side and a pear on the other," Naidu said. "We can see quite a few signatures related to topographic features such as large flat regions, small concavities and ridges on the surface of the nucleus." According to the new radar observations, comet P/2016 BA14 appears to spin around its axis once every 35 to 40 hours. Vishnu Reddy, of the Planetary Science Institute, Tucson, Arizona, also observed comet P/2016 BA14 using the NASA Infrared Telescope Facility (IRTF) on Mauna Kea, Hawaii. Data collected (infrared spectra) indicate that the comet reflects less than 3 percent of the sunlight that falls on its surface. Comet nuclei are as dark as fresh asphalt. However, infrared spectra can often yield clues to the makeup of these primitive denizens of the solar system. Comets can be tricky. These interplanetary vagabonds often appear from the furthest-most reaches of the solar system, popping-up unexpectedly in surveys for near-Earth objects (NEOs). Also, they may not even resemble a comet as they’re still in deep freeze, not producing their trademark fuzzy coma and tail produced by sublimating ices. Oh, and often it can be hard to measure their size until they make a close pass of our planet. And sometimes they can give us a fright. 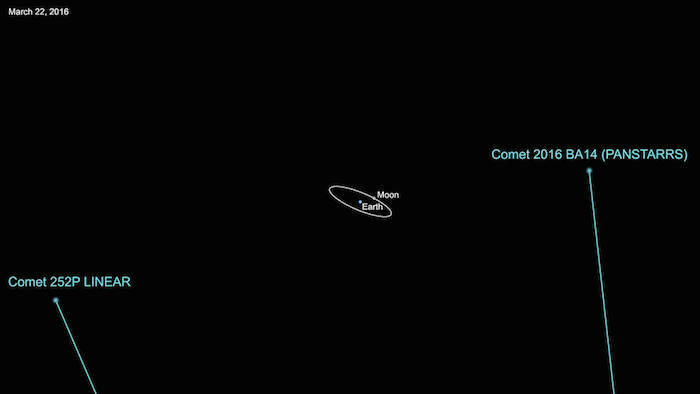 Enter P/2016 BA14, a comet that was first detected as an asteroid by the University of Hawaii’s PanSTARRS telescope in January and then re-identified as a comet by the Discovery Channel Telescope at Lowell Observatory in Arizona. BA14 is notable for a few reasons, but it is now most famous for being the third closest comet flyby in recorded history. On March 22, BA14 came within 2.2 million miles of Earth, that’s only 9 times the Earth-moon distance. Interestingly, it flew past Earth only a day later than another comet, 252P/LINEAR, which is a well-known comet having been discovered way back in 2000. Estimates of 252P’s nucleus size put it at around 250 meters (820 feet) wide and BA14 was presumed to be around half that size. Due to their similar orbits, astronomers believe both objects were once likely part of the same object that broke up some time in the past. However, as BA14 made its Earthly close encounter last week, NASA’s Goldstone Solar System Radar in California’s Mojave Desert was able to spend 3 nights observing the object, revealing its spin and true size. This hunk of ancient icy space rock spins once on its axis every 35 to 40 hours is 1 kilometer (3,000 feet) wide! This is a lot bigger than previously estimated, but why the huge discrepancy? The radar imagery was able to observe important features on the comet’s surface that may help scientists better understand the comet’s origins. Despite how bright the vapor tails become when lit by sunlight, comet nuclei themselves are often very dark — a contributing factor to the huge uncertainties when estimating cometary dimensions. With the help of NASA’s Infrared Telescope Facility (IRTF) on Mauna Kea, Hawaii, astronomers realized that BA14 is only reflecting 3 percent of the sunlight that falls on it, making its comet nucleus “as dark as fresh asphalt,” according to a NASA news release. Its extremely low albedo (reflectivity) is the most likely reason its dimensions were significantly underestimated when the object was first discovered. 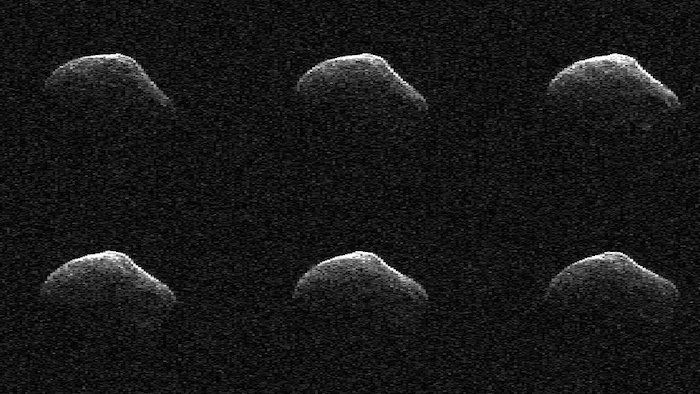 Astronomical detection of comets and asteroids rely on how much light is reflected off their surface. If they are darker than thought, less light is reflected and size estimates will be underestimated. And it seems that’s exactly what happened with BA14 — its extremely dark surface hid its true size and only when it got come enough (i.e. flyby) were we able to bounce radar off its surface to see its real bulk. Now astronomers will be hard at work trying to better understand where this comet came from and how it formed. Scientifically, in-depth studies of comets are important as these objects were formed direct from the protoplanetary disk that condensed around our sun before our Earth formed over 4 billion years ago. Comets are the pristine “time capsules” of our solar system that hide their ice under a dark sooty layer of dust. But in regards to planetary defense, the discovery of such a significant comet only months before such a close approach with Earth is a troubling reminder of the large NEOs that have still to be discovered. We were never in any danger from this object — its orbit was always giving Earth a wide enough berth — but still, I'm thankful BA14 didn’t come any closer.